Figuring out which college I wanted to attend was the hardest decision I have ever made. I was never one of those kids who knew exactly where they wanted to go for college and what they wanted to study. When the time came to choose colleges during my senior year of high school, there were three colleges that I was deciding between, and they each catered to a different aspect of my life. I was looking into attending the Academy of Art University to pursue a career as a video editor, I was being recruited to University of Redlands to play lacrosse, and I had been accepted into UCLA as a result of my academic success in high school. When it came time to choose a college, I was conflicted. I felt as though I had to choose between my art, my sport, and my studies. Today, having one quarter of college under my belt, I can say that I made the right decision when I chose to attend UCLA. I had thought that when I chose a college I would have to choose one of my interests and sacrifice my other two, but that has not been the case at all. At UCLA I’m not only getting a world-class education, but I am also playing club lacrosse and living in Los Angeles, home of the film industry. 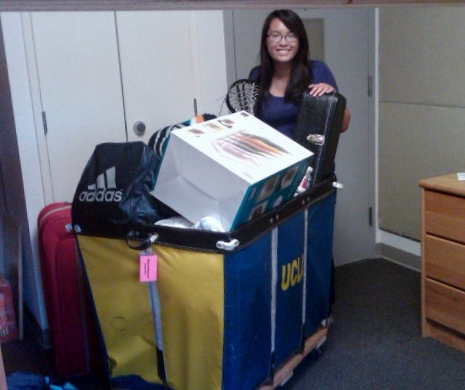 Moving away from home was one of the most nerve-wracking experiences of my life. One thing that made the move to UCLA a lot smoother for me was the fact I am among a number of other Dublin High graduates that have become UCLA Bruins. First and foremost, one of my two roommates is one of my best friends from high school. We have very different majors, are involved in different activities, and have different groups of friends, but we still end up spending a lot of time together. I’ve also made a weekly ritual of watching Glee every Tuesday with two other DHS graduates. 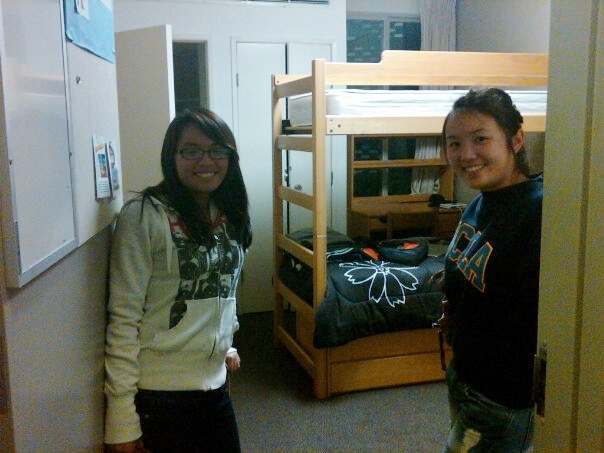 I have found that it’s really nice to have familiar faces from home on such a large, exciting campus. It’s almost as if we brought the tight-knit community of Dublin to UCLA with us! I like to think that the classes I took during my first quarter were interesting, but others like to call them random. I took three classes: Climate Change, Discovering Romans, and French 3. Since I am currently undeclared, I am taking GE classes for my first few quarters. My classes were all very interesting and I really liked all of my professors. My Climate Change teacher is German and told hilarious anecdotes about adjusting to life in the US and my Romans teacher not only made the world of Ancient Rome extremely interesting, but she also amused us with her fears of becoming a cat lady. The lecture-and-discussion style of classes took a bit of getting used to. It was sometimes hard for me because I tend to get restless towards the end of a lecture. I found that bringing something to snack on during lectures has helped me stay alert. Getting an adequate amount of sleep is also important. It’s really difficult to stay alert and focused when sleep-deprived. I’m very content with my grades after my first quarter. I had always had an interest in French during high school and I studied French for three years at DHS. I decided to pick up French again in college. Language classes are a lot more like high school than other classes. We had a class size of about twenty students and had class every day. Language classes at UCLA are full immersion, so speaking English usually has no place in class (except for occasional comments amongst confused students). French was the only class where the instructor was able to really get to know students on a more personal basis. I enjoyed my French class so much that I’ve decided to minor in French. As for my major, that’s a little bit more complicated. In high school I took ROP Multimedia and through an internship during my senior year, I decided that I want to be a video editor. My goal is to be accepted into UCLA’s School of Theater, Film, and Television (TFT) as a Film, Television, and Digital Media major. I can’t apply until the end of my second year, so I have a while to wait. I’m also looking into majoring in Communication Studies if Film doesn’t work out, or if I change my mind between now and the end of my second year. At the very beginning of my freshman year of high school, I was advised that the best way to make the most of my high school years was to get involved. I’ve learned that the same applies in college. During my freshman year of high school I got involved with the lacrosse program at DHS. Lacrosse was, without a doubt, one of the best parts of my high school experience and it has become a huge part of my life in the past four years. 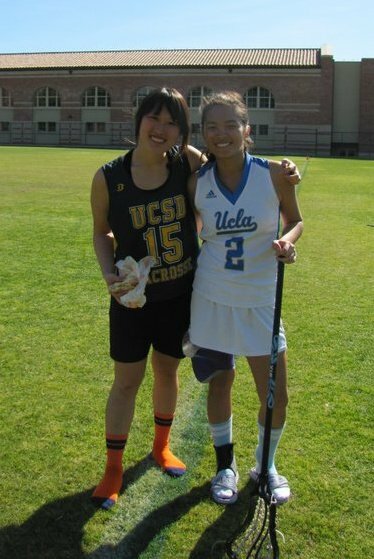 I knew that I wanted to play lacrosse in college, so when I sent in my SIR to UCLA, I got in touch with the UCLA lacrosse coach immediately. Joining Bruins Lacrosse has been a really great way for me to make friends, do something that I love, and fight off the infamous “freshman fifteen”. UCLA does not have a NCAA lacrosse program, but we have a very strong club program and our “A” team usually goes to nationals. For our fall season (lacrosse is technically a spring sport, but we play year-round) we attended two tournaments, one at UCSB and another at UCSD. We practiced five times a week, two of those practices at 7 AM. I have to admit, I always dreaded dragging myself out of bed for morning practice, but I always felt great after the workout. And even better, morning practice days were the only days that I was ever up early enough to grab breakfast in the dining hall. Our other three practices were night practices during the week. Usually after night practice I would grab dinner in the dining halls with a group of my teammates. Morning practices and all, I’d have to say that my first quarter of lacrosse went really well. I would definitely stand by the advice of “getting involved” when you get to college. One great thing about playing a sport as a freshman is that the majority of my teammates are upperclassmen, so I have received a lot of advice from them about college life. I love spending time with my teammates and joining lacrosse has definitely made the transition to college a lot easier for me. One thing I must mention about UCLA is the incredible dorm food. In fact, it’s been voted second-best in the nation. We have three dining halls on “the hill” (that’s what we call the part of campus where all the dorms are). All three dining halls are all-you-can-eat buffets with diverse menus that change every day. We also have a delectable array of desserts with every meal. If I didn’t have lacrosse, I’m sure that I would be well on my way to the freshman fifteen by now. We also have a number of quick-service restaurants on the hill that offer a wide variety of different kinds of food. A friend of mine visited me this quarter and said she felt like she was on vacation after eating in our dining halls. Seriously, if you need one reason to come to UCLA, come for the food! Something that I did not expect was the LA weather. My experiences with the weather this year have led me to believe that all of my preconceived notions regarding the weather in LA (as in sunny and warm year-round) are incorrect. Often times the weather is just as expected: blue skies, white clouds, and sunlight warm against your skin. But then the next day it will be gloomy, grey, and wet. Yes, I said wet. It rains in LA, who knew? I suppose the rain wouldn’t be so unexpected if it wasn’t interspersed with patches of 70-degree sunshine in the middle of December. Turns out I probably should have packed my rain boots from back home (I made sure to bring them back to school after Thanksgiving break). All in all, after all of the stress of choosing a college, I am very happy that I chose to attend UCLA. 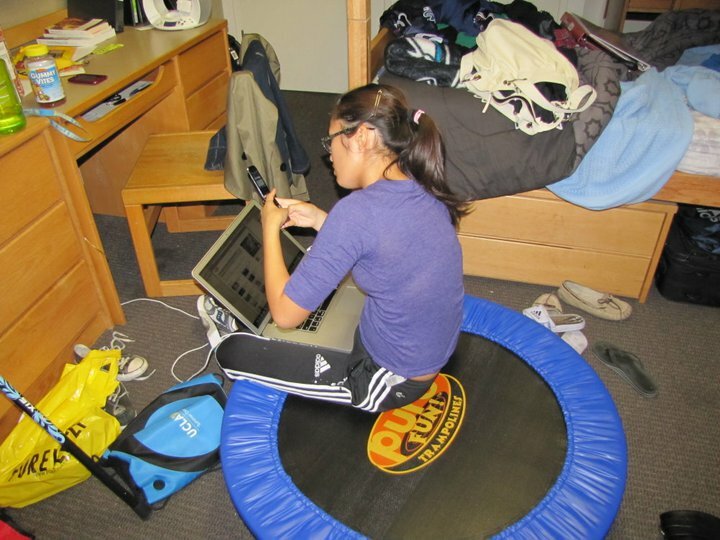 As a person of many interests, UCLA offers many opportunities for me to do what I love. I think for anyone who has to make a tough decision between schools, it’s important to think about the big picture and choose a college that offers the academics, athletics, and extracurricular activities that you want in a school. At the Dublin High School 2010 Senior Awards Night Deanna Hong was awarded the French Department Scholarship. Deanna is also a California Scholarship Federation Life Member and was recognized with a Gold award under the President’s Outstanding Academic Achievement program.